Established in 1622, the university was closed in 1810 and re-established in 1962. Today, it has around 18,000 students and 2,800 employees and is the largest educational institution in Salzburg state. On 23 July 1622 Archbishop Paris Lodron appointed the scholar Albert Keuslin first rector of the Benedictine university. Keuslin, a graduate of the Jesuit University of Dillingen, had established the Akademisches Gymnasium, a secondary school, at Salzburg five years earlier. By resolution of Emperor Ferdinand II, issued on October 8, the Gymnasium was raised to a university. While the Thirty Years' War raged outside the Archbishopric of Salzburg, the university was built up and maintained by a federation of Benedictine abbeys from Salzburg, Switzerland, Bavaria and Austria. In its early years, courses taught were theology, divinity, philosophy, law, and medicine. During the Napoleonic Wars, the Prince-Archbishopric was secularized as the Electorate of Salzburg in 1803. It was ruled by Archduke Ferdinand III of Austria, a brother of Emperor Francis I, who established a Faculty of Medicine. After Salzburg was annexed by the Kingdom of Bavaria in 1810, however, the university was closed on 24 December and replaced by a Lyzeum college with sections for divinity and philosophy, as well as a school for medicine and surgery. After the Napoleonic Wars, Salzburg became part of the Austrian Empire. The divinity section was again converted to a faculty in 1850. In World War I, plans were evolved to relocate the Francis Joseph University from Czernowitz to Salzburg, though never carried out. The University of Salzburg was not re-established until 1962, with a faculty of Catholic theology and a faculty of philosophy. Classes resumed in 1964, with a faculty of law added the following year. In 1975, a new federal law regulated the organisation of all Austrian universities. The University of Salzburg created four academic divisions: the Faculty of Catholic Theology, the Faculty of Law, the Faculty of Humanities, and the Faculty of Natural Sciences. A fifth division, the Faculty of Medicine, was not realized. In 1995, the organisation of Austrian universities was further restructured with more faculty autonomy. The university gradually incorporated new academic programs through 2004 into 32 Fachbereiche or “departments”, and again, decided not to create a Faculty of Medicine. The University of Salzburg has no central campus, occupying several buildings in Salzburg's historic centre: parts of the Salzburg Residenz building (Toskanatrakt) and on Kapitelgasse south of Salzburg Cathedral. The university library is located between the Kollegienkirche (the University Church) and the Großes Festspielhaus; attached to it is the Große Aula, or ceremonial hall. The traditional faculty building of Humanities (Communication Studies, Sociology and Political Science) is located by the Rudolfskai, only 100 metres from Mozartplatz and Papagenoplatz. The Faculty of Sciences is housed in the second largest building in Salzburg after Hohensalzburg Fortress, and is located just further south next to Schloss Freisaal Castle and Frohnburg Castle. Completeted in 2011, the Unipark Nonntal campus (replacing the old location at the Akademiestraße) is home to the departments of modern languages, and cultural and social sciences. The building is 17,000 square metres in size, with 5,500 students and 300 academic staff. There is a library and an Auditorium Maximum. Financing for the construction of the Unipark Nonntal was enabled by successful negotiations between Salzburg’s state governor Franz Schausberger and the Federal Ministry of Education. Originally designed in 2002 by architects Storch Ehlers Partners, it was constructed in three years. Smaller university offices and institutes are scattered throughout the city, with arts and music being taught at the Mozarteum University Salzburg. ^ Robert Kriechbaumer: Umstritten und Prägend. Kultur- und Wissenschaftsbauten in der Stadt Salzburg 1986–2011. Böhlau Verlag, Wien, Köln, Weimar 2012, ISBN 978-3-205-78860-7, S. 215. Salzburg, literally "salt castle", is the fourth-largest city in Austria and the capital of Federal State of Salzburg. Dom Prokop Diviš, O.Praem. was a Czech canon regular, theologian and natural scientist. In an attempt to prevent thunderstorms from occurring, he inadvertently constructed one of the first grounded lightning rods. 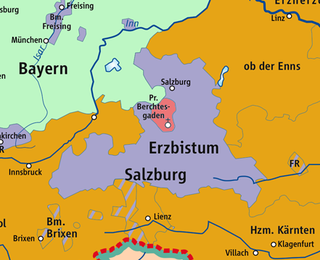 The Prince-Archbishopric of Salzburg was an ecclesiastical principality and state of the Holy Roman Empire. It comprised the secular territory ruled by the archbishops of Salzburg, as distinguished from the much larger Catholic diocese founded in 739 by Saint Boniface in the German stem duchy of Bavaria. The capital of the archbishopric was Salzburg, the former Roman city of Iuvavum. The University of Graz, located in Graz, Austria, is the largest and oldest university in Styria, as well as the second-largest and second-oldest university in Austria. The University of Innsbruck is a public university in Innsbruck, the capital of the Austrian federal state of Tyrol, founded in 1669. The Lucian Blaga University of Sibiu is a public university in Sibiu, Romania. Named after the philosopher, poet, and playwright, Lucian Blaga, it was founded in 1990 with five schools: Letters, History and Law, Medicine, Food and Textile Processing Technology, Engineering and Sciences. The University of Douai is a former university in Douai, France. 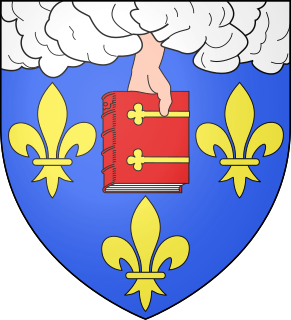 With a medieval heritage of scholarly activities in Douai, the university was established in 1559 and lectures started in 1562. It closed from 1795 to 1808. In 1887, it was transferred as University of Lille 27 km away from Douai. Admont Abbey is a Benedictine monastery located on the Enns River in the town of Admont, Austria. The oldest remaining monastery in Styria, Admont Abbey contains the largest monastic library in the world as well as a long-established scientific collection. It is known for its Baroque architecture, art, and manuscripts. St Peter's Abbey, or St Peter's Archabbey, is a Benedictine monastery and former cathedral in the Austrian city of Salzburg. It is considered one of the oldest monasteries in the German-speaking area, and in fact the oldest with a continuous history since its foundation in 696. Adolphus von Dalberg was a German Benedictine Prince-Abbot of Fulda Abbey and founder of the former university in the same city — University of Fulda. The Electorate of Salzburg, occasionally known as the Grand Duchy of Salzburg, was an electoral principality of the Holy Roman Empire from 1803–05, the short-lived successor state of the Prince-Archbishopric of Salzburg. The University of Lucerne is a public university with a campus in Lucerne, Switzerland. 1,460 undergraduates and 1,258 postgraduate students attend the university, which makes it Switzerland's smallest university. The University of Warmia and Mazury in Olsztyn was established on 1 September 1999, in accordance with the new Statute of Sejm signed by Polish President Aleksander Kwaśniewski, as well as Minister of Education Mirosław Handke, in August of the same year. Ryszard Górecki became its first chancellor. The Faculty of Theology was established with an agreement between Polish Episcopate and the government, in the presence of Cardinal Józef Glemp, among others. The university's first academic year started in October 1999. The Museum der Moderne Salzburg has two buildings at two different locations in Salzburg, Austria. The Rupertinum in the old town for new artistic concepts opened in 1983 and the Museum on the Mönchsberg for modern art in a contemporary setting opened in 2004. Mathews Mor Antheemos is a Syriac Orthodox bishop, currently Metropolitan of Muvattupuzha Region and Patriarchal Vicar of U.K. & Ireland Dioceses.